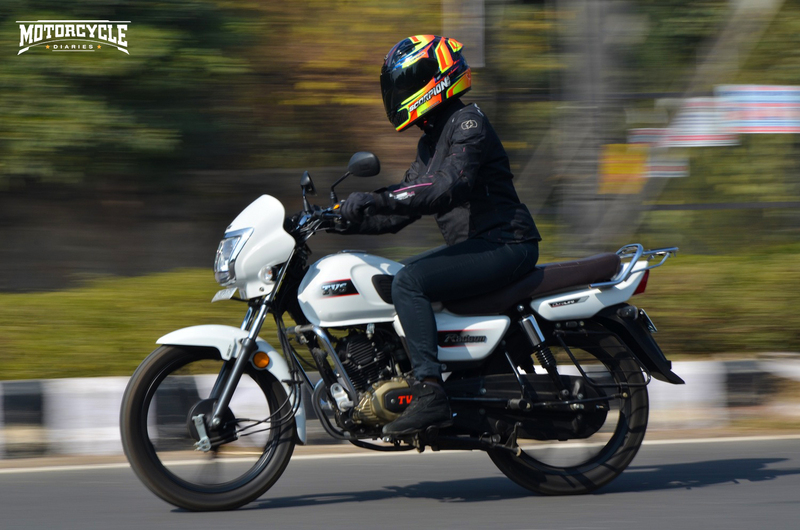 Perhaps the most difficult to mull over motorcycle type belongs to the commuter segment. Performance and fuel efficiency must go hand in hand along with affordable retail pricing and lower spare part costs. In this already complicated mix, TVS has just added quality and design. Yes there were others who tried it, but with the Radeon TVS has nailed the proportion. 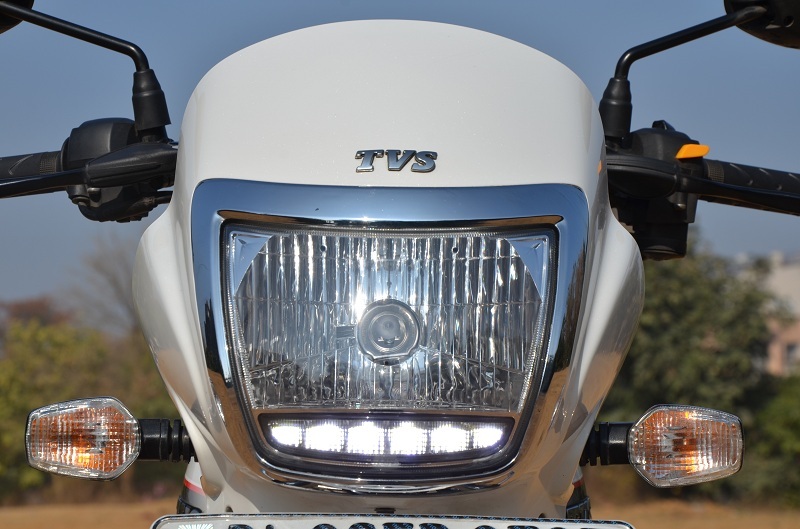 It’s been a while since TVS Radeon was launched in the market and you’re already seeing a few on the roads. 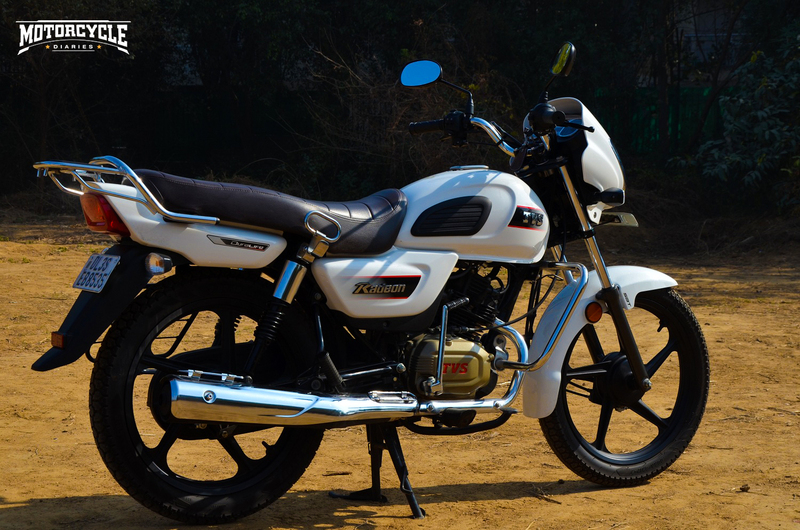 And it competes with the market leader directly, Hero Splendor, so it definitely has some mettle to go along. I’ve always been a fan of TVS for their commendable effort. 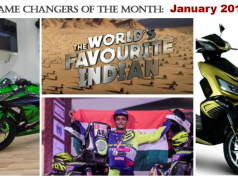 Looks at the RTR family, N-TORQ, Jupiter and the excellent RR310. And I am confident in Radeon too as an idea and its execution. 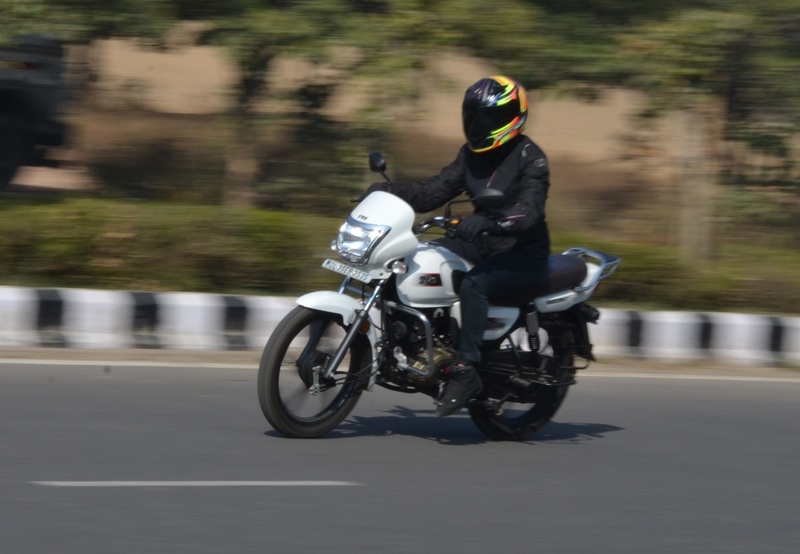 While riding through the bustling streets of Delhi Noida it was surprising to see so many commuters, mostly disinterested pottering along at 30kmph through anything, getting interested to know more about it. Looks nice! Is it more fuel efficient than the Splendor! 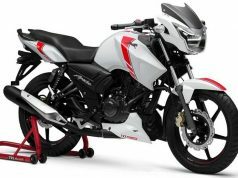 TVS is doing a good job with its motorcycles! That seat looks comfortable! Does that DRL stay on all the time! I was happy to see a bread and butter bike getting so much attention. Partly because this white colour with dark tan seat looks great, and partly because it sounds nicer than others around. Massive advantage of that bright DRL too, car drivers notice it in their rear-view mirror sometimes giving you a safe passage when they’re not in a mood to crush you. Then you come to that comfortable nicely padded seat. It is large enough for substantial bums for long periods of time but the suspension is slightly hard which I’ll come to later. And there are rubber knee grips on either side of the tank which is a nice touch, helping you avoid slipping on a flat seat. 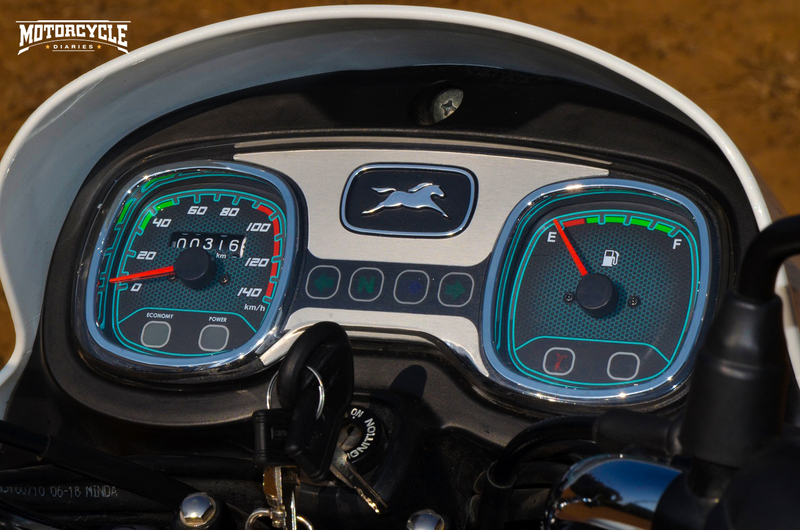 The instrument cluster is a cool looking feature for a commuter. It is wide and has a speedo on one end and fuel gauge on the other. Since it is a TVS you get Eco and Power indicator which vaguely tells you when to modulate throttle to maximize fuel efficiency. The rear end is functional with a slightly boring tail light though. Why when you’re jazzing up the bike stop just before the tail light? 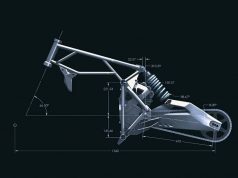 But you get a rack and flexible indicators for better functionality. The engine on a commuter must be robust to handle everyday workload, be fuel efficient and hugely tractable. TVS Radeon edges even further with its quick response and great mid-range performance. 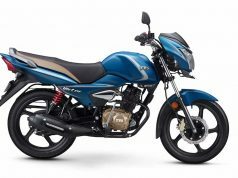 Its 109.7cc single air-cooled unit produces similar power as the 97.2cc Hero Splendor, but generates a smidgen more torque. Radeon cannot match the fuel economy figures for the legend, but will definitely thrash it on the highways and through the city. Radeon’s exhaust note too sounds a segment above with a bigger engine. Fuel efficiency is somewhere around 70kmpl, and yes we were pelting it like mad. An easy commute around the city will give you even better value. I surely liked the way power is delivered. It’s smooth rising through the rev range and has healthy torque mid rpm. Clutch action though is typically TVS. I’m not a fan of that short release zone where the clutch starts biting and immediately delivers all of the ponies piled on top of each other. As I mentioned earlier, the shock setup is on the stiffer side. There is a good reason for that. Radeon has to take care of your spine and also its frame as it can carry a decent amount of luggage on its carrier. Radeon has been built to perform on rural and urban roads alike. So stiffer suspension means strength on rural broken patches with weight on and better handling performance on urban everyday roads. 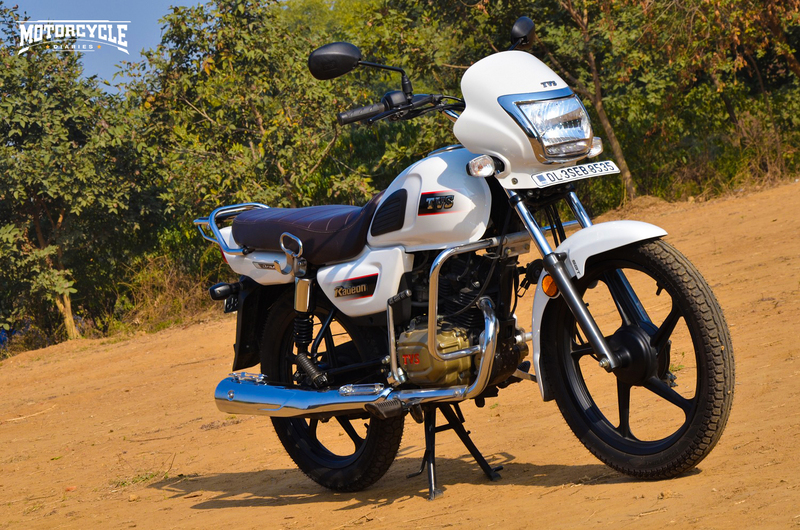 In fact another reviewer friend stated that it performs similarly to the likes of RTR 160, which I agree to. 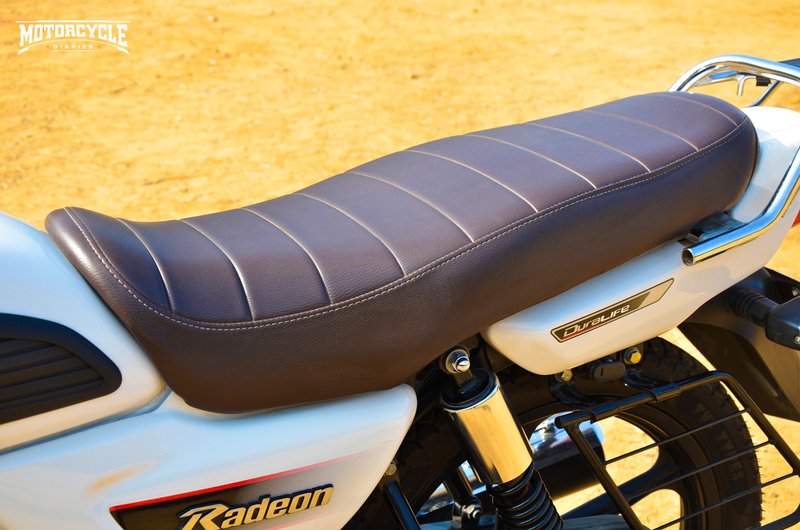 And since the seat is large and comfortable you should be able to ride it all day with a pillion or luggage on board. 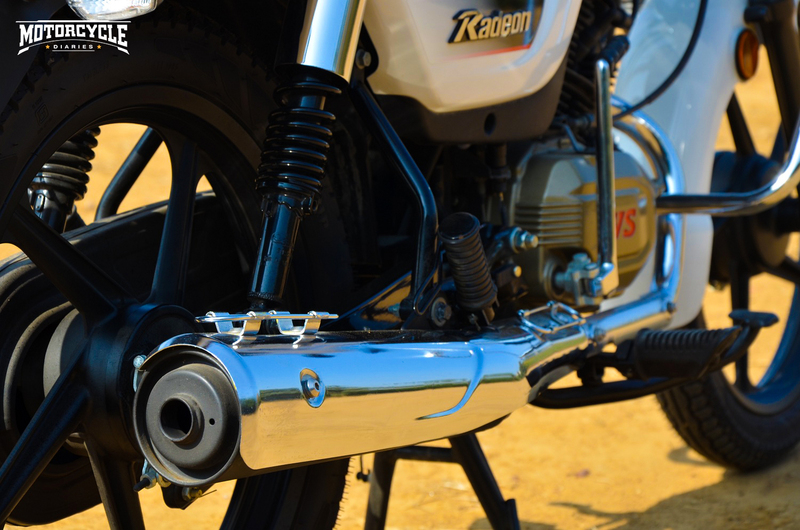 Radeon has 180mm ground clearance which should help you just walk past rough patches and unpaved roads without scraping its belly. But do slow down on speed breakers because the ride is stiff and it’ll jump back to hit you in the crotch. There are drum brakes on the front and rear. 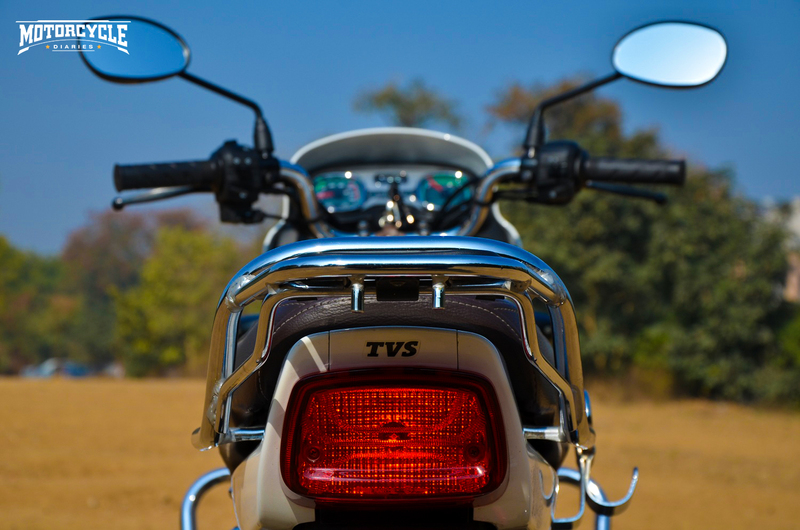 For safety, TVS has put in synchronized braking which essentially brakes both drums even if you squeeze one lever. This helps distribute brake force on both the wheels giving you a safer stop. 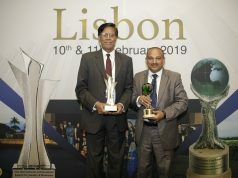 TVS has been working hard on developing better tyres for the Indian market and it shows. Radeon comes with these TVS Dura Grip tubeless tyres which are better than most in this segment as stock OEM fitment. The drum setup though is something I do not like at all. A small disc on the front wheel will do wonders against than fade you get on regular use. All-in-all TVS Radeon is a very good product in the segment it is competing in. It cannot knock off the leader yet, but can certainly give it a run for its money. 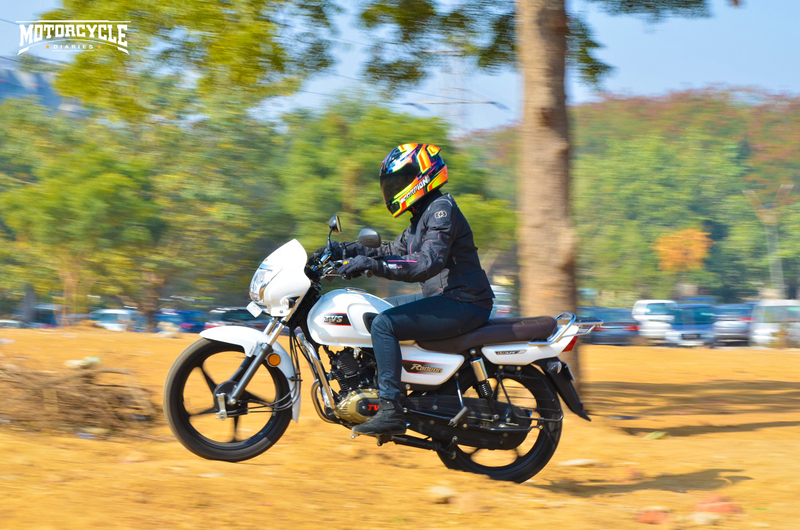 Radeon looks better as a commuter and delivers good fuel efficiency without losing that sporty TVS character and sound. Colour combinations on offer are another positive. Pick the white or the beige and you’ll be turning heads for sure. 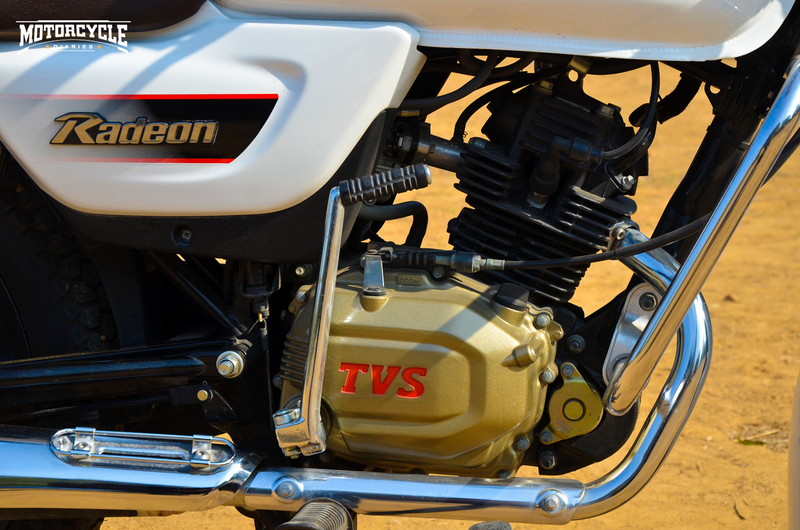 TVS Radeon brings that attention which was missing from everyday commuters. 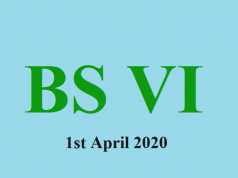 This one definitely looks like another winner, TVS is on a roll.